Walking around at night in the rain can be a dangerous activity since visibility is usually limited. 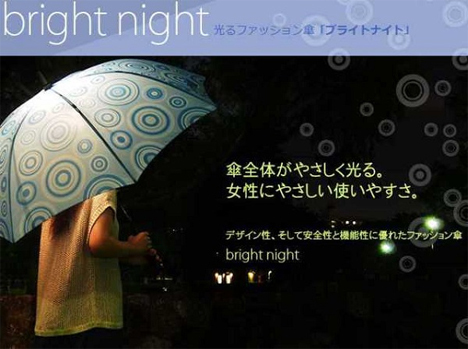 Japanese company Century wants to keep people safe in the rain (particularly women and children), which is why they created the Bright Night Umbrella. The umbrella looks like any other except that it has a cool-running 6V krypton light at its highest point under the canopy. The canopy of the umbrella reflects the light and causes it to illuminate the path up to 6 feet ahead of the person carrying it. This field of illumination should be sufficient for making your way around in the dark or semi-dark hours. Of course, it seems kind of like the opposite of safety to light a “vulnerable” person up at night. The light of the umbrella can be seen from up to 95 feet away, giving potential attackers a very easy path to follow right to the person carrying the umbrella. 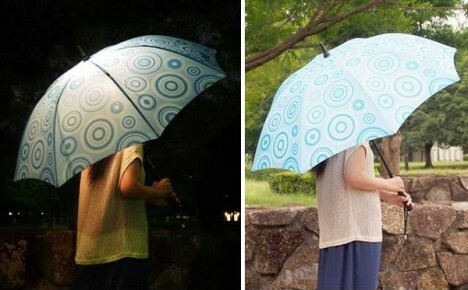 The manufacturer’s information says that the umbrella is composed of a light but sturdy polycarbonate. The fabric of the umbrella is treated with a water-repellent coating and comes in several different colors to match your tastes. It’ll cost you the equivalent of about $40, but it comes with a replacement bulb and carrying case, which makes it seem like a pretty good deal if you’re always tripping over your own feet during your walks in the rain. See more in Home & Personal or under Gadgets. August, 2013.